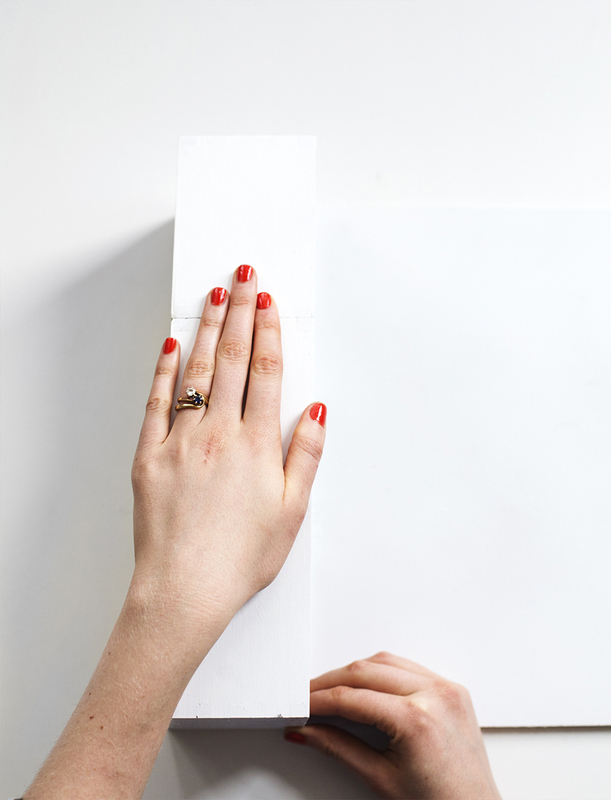 Some of us wish we could muster the headspace to be more organized, and others of us live and breathe organization down to every last detail. Whether you’re either of the above, we all know the importance of keeping our desks ship shape throughout the week. 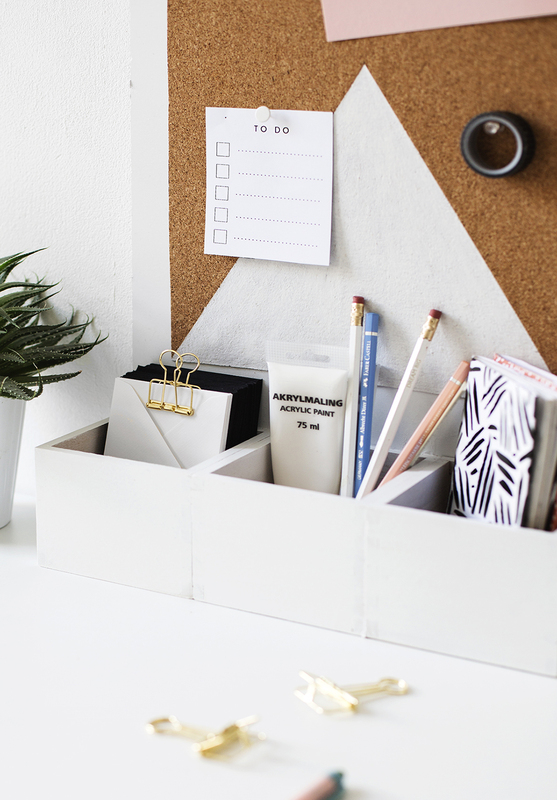 A clear and tidy space makes for a clear and tidy mind right? I, Teri, can’t say I’m always the best at this but I have very orderly aspirations let’s just say. I really do work so much better when everything has it’s home and my lists are right there in front of me, dictating what I do next. Apparently I’m a simple creature. 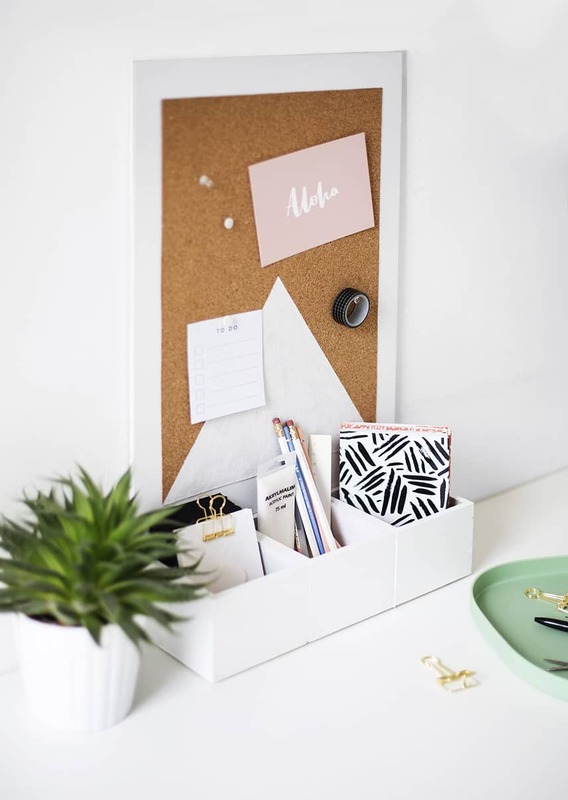 This project is much simpler than it looks and gives you an easy way to keep some of your supplies in check, along with a pin board to tac your important lists, receipts, reminders or even just some much needed inspiration to. 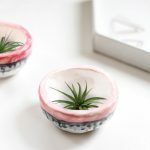 This DIY idea doesn’t involve any hammers, nails or drills which is always a bonus if you ask me. Along with that it’s freestanding which means no nails in the wall, perfect for renters or the more indecisive of us who can’t commit to where they want to work. It’s easy and versatile so there’s no excuse not to whip up one for yourself. To get the backing board, simply measure how tall you want it to be and make sure the width is the total of all three of the wooden boxes laid side by side. You can just head to your nearest commercial hardware store and ask them to trim the wood to your exact measurements. Start by spray paint the wood and boxes white. 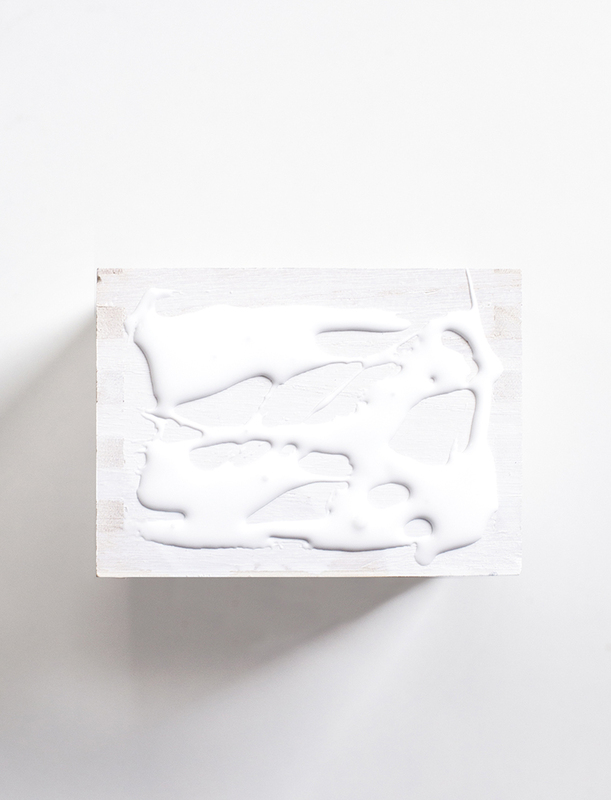 Cover your surface and do this in a well ventilated area, laying down thin coats of paint and allowing each to dry in between. When they’re dry, squeeze some of the wood glue on the sides of the boxes to stick them together. 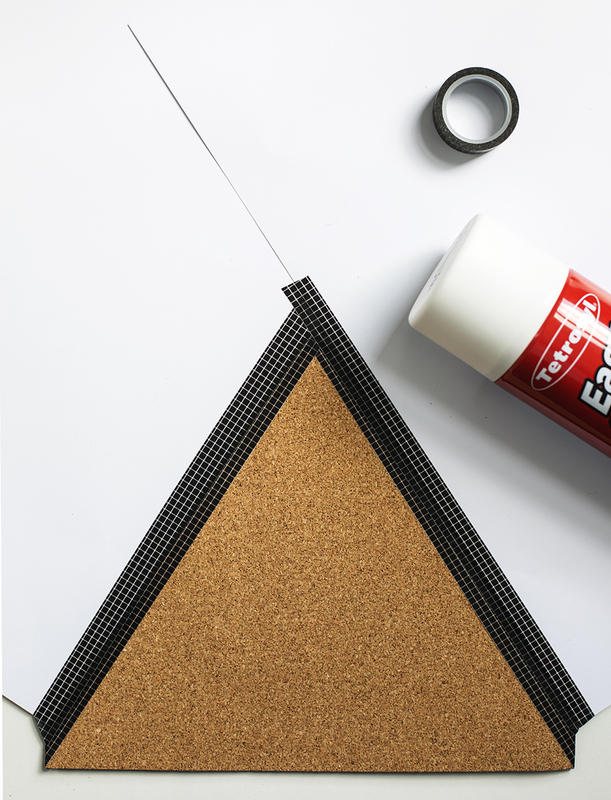 Make sure the glue doesn’t go right to the edge when you’re applying. The three boxes should be joined together, side by side with the open ends facing the top. Apply a bit of pressure for a minute or two hold them together. After about 15 minutes the glue will have started to set so now you can squeeze some wood glue onto the back of the boxes and the bottom of the wood board to stick these parts together. Make sure to line up the bottom of the boxes with the bottom of the wood as this will create a right angle for the organiser to stand straight upright. Apply some pressure again for a minute and then leave to dry, preferably overnight. Now you can see the space you have for the pin board so use a ruler to measure how big your cork section needs to be to fill the space. It’s nice to leave a white border around the edge up to about an inch. When you’ve measured this, draw out the shape on the back (the peelable side) of the cork. Cut this out with a scalpel and ruler. 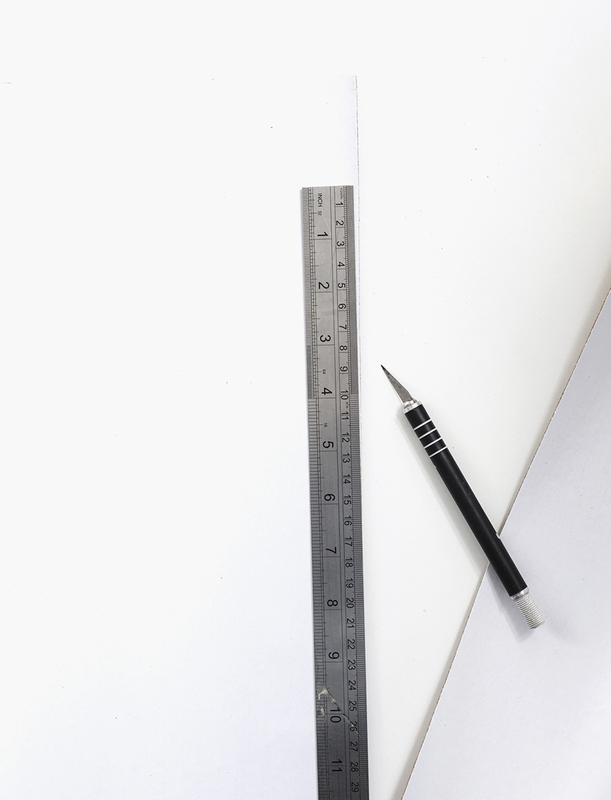 On the front of the cork sheet, measure a centre point within the width and use this to create the triangle shape. Place the tape on that centre point and lead it down to the bottom corner, repeating on the other side. A central point closer to the bottom will result in a shorter triangle and vice versa. Tape the spare paper to cover the rest of the cork so that the only part that’s showing is the part you want white. Spray paint this section with a few light coats. Watch out as some spray paints don’t take to cork well, in which case you can easily use a few coats of white paint. 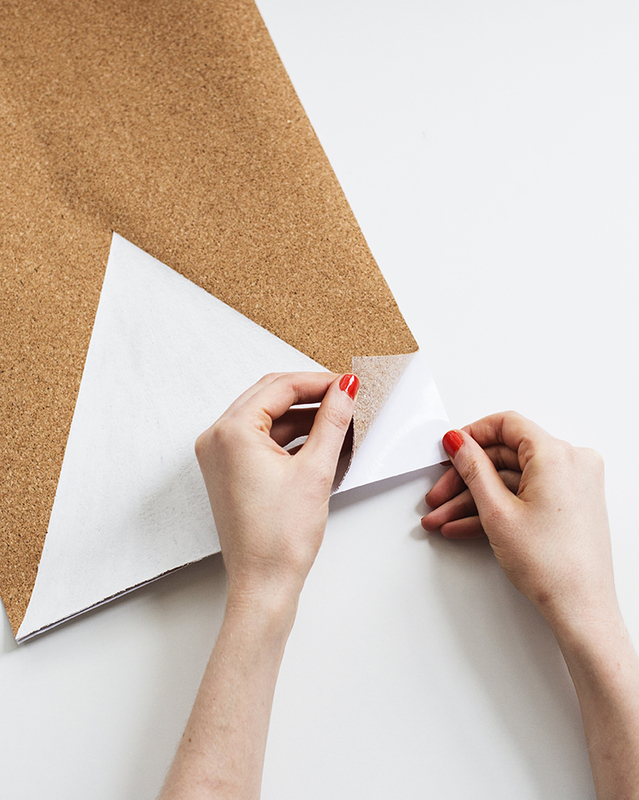 Remove the tape and spare paper once dry and peel away a corner of the backing paper. Place this on the wood panel, lining it up before you stick. Once stuck you can pull the rest of the backing away slowly, sticking as you work your way across the wood. Smooth out and you’re all done! 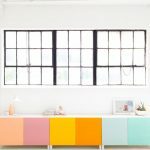 You can play around with colours and shapes to spray paint but I love this fresh and minimal version to brighten up any workspace. Get out your drawing pins and start adding reminders and inspiration along with filling the boxes with all of those office strays. My workspace is already looking tidier which is handy as I don’t even have a separate room to work in. My home is all open plan so every little helps. 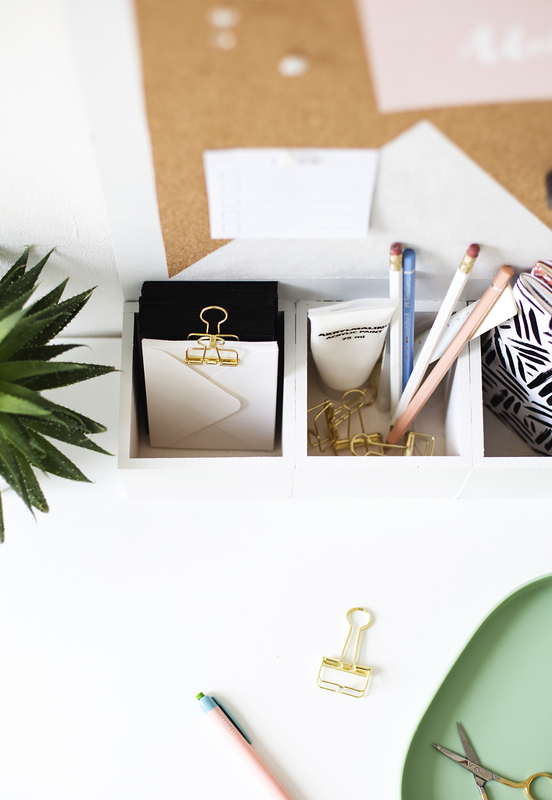 Good luck in your own quest for a better organized desk! 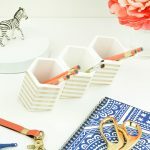 This desk organizer is so cute! I love it! Glad you love it, Paige! Absolutely amazing! I love this organizer! Love this. 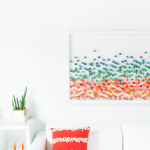 Such a pretty and simple DIY! Right?! I love how simple Teri kept it! So cute! 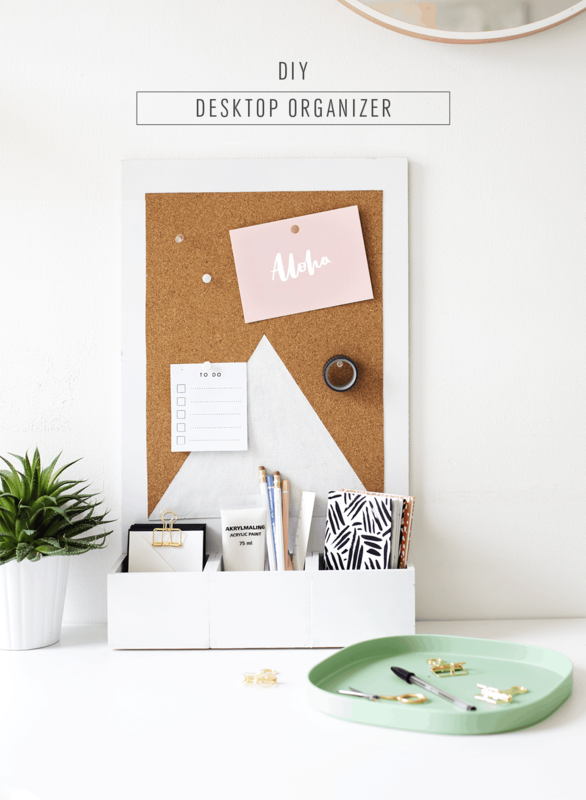 I love that this DIY keeps your desk organized while adding a bit of style to your office:) I will have to set some time asside to make this! Awesome! Be sure to share it on our hashtags so we can follow along, too! #sugarandcloth #mysugarandcloth! Nice organizer. I love having a clean and organized desk. It makes me feel ready to work! terri, you are so talented! i always love your diy’s. this is so chic, i love the simple triangle. 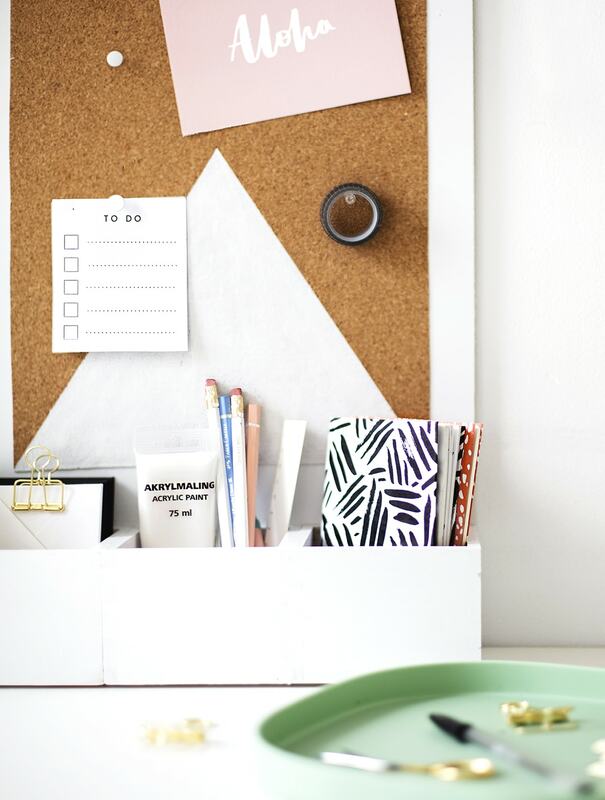 and the built-in cork board is brilliant! love it all! I love it! Thank you for this tutorial. This is so cool and simple idea. I love this DIY.